DataNET Software, Mobile Tracking, Vehicle Tracking, Vessels or Trains Tracking. Datalink, the "Go To" Company for wireless data solutions ! DataNET Host Software. Matured over fifteen years. Installs in client's own servers behind firewalls. AES-256 encryption option for Government and Military Agencies. Merges multiple data networks, Satellite and Terrestrial. Pricing scaled to address small and large organizations. 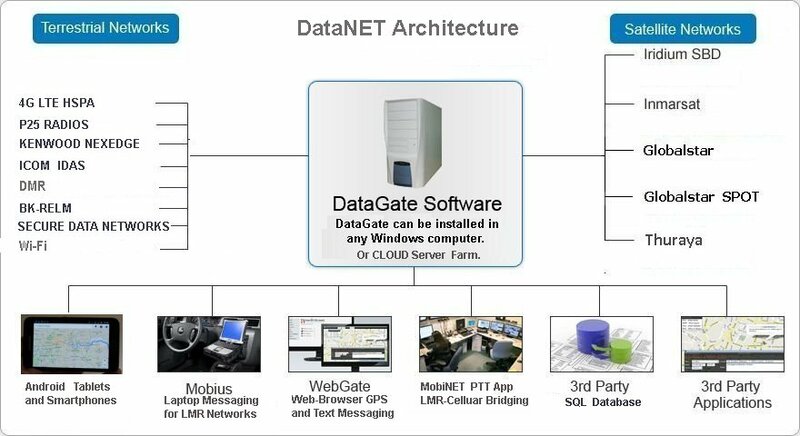 DataNET is a complete suite of software programs that allow end-to-end communication between field personnel and remote assets and host workstations. Whether you are tracking and messaging personnel, remote mobile assets such as vehicles, vessels or trains, or communicating with remote pumps or weather stations, DataNET provides you with the platform that enables you to communicate on a Global basis.